22 years ago, moviegoers were enthralled by the images of lifelike dinosaurs in Steven Spielberg’s Jurassic Park. More than two decades later, advancements in technology offer up the best in visual effects as well as premium 3D in IMAX – and the dinosaurs’ return to the big screen is more realistic than ever before. This time, Spielberg takes a back seat as Executive Producer, with the fourth installment of the Jurassic Park film series directed by Colin Trevorrow. 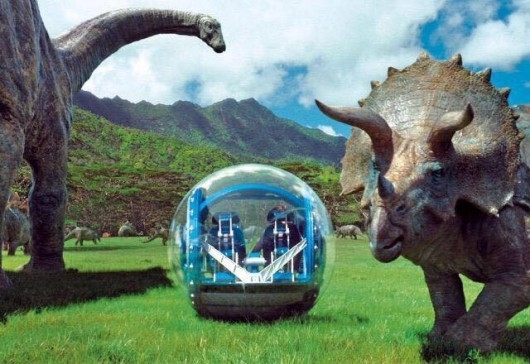 The film takes place on Isla Nublar, a tropical island off Central America depicted in the previous films. On it is Jurassic World, a new dinosaur theme park owned by Simon Masrani (Irrfan Khan), CEO of Masrani Corporation. At the company’s request, the geneticists create a new genetically-modified dinosaur, a hybrid of more than one type of dinosaur DNA, in a bid to boost interest in the park. 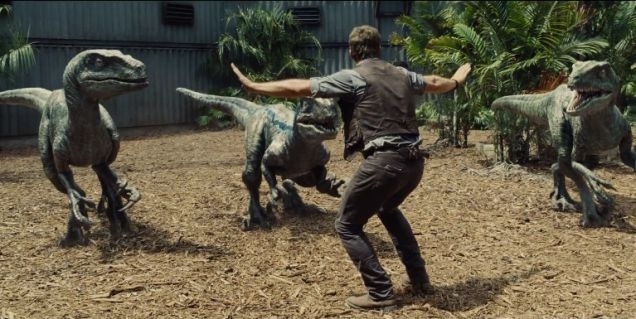 Chris Pratt stars as Owen Grady, one of the park’s staff and trainer of four Velociraptors. Bryce Dallas Howard plays Claire Dearing, the park’s operations manager, and her nephews Zach (Nick Robinson) and Gray (Ty Simpkins) visit the island over a weekend. When Claire introduces Simon to the hybrid the first time, everything goes as planned. But when she brings Owen to take a look, a misinterpretation lets the hybrid escape from captivity and all hell breaks loose. With the safety of thousands of park-goers compromised and the lives of her two nephews at stake, it is up to Claire to salvage the situation. Owen taps into his experiences and knowledge while the Jurassic World security team is activated to contain the hybrid and prevent more damage from being done. Trevorrow starts off the film slow as he re-introduces the park and new characters, making sure audiences follow the story on the right track. Told at a comfortable pace with consistency, the movie escalates at the right moments and the plot progresses steadily. Every encounter with the hybrid takes a dramatic turn, and each scene carries its own suspense. Though none as thrilling as the Spielberg original. Fresh off from his starring role in Guardians of the Galaxy, Pratt retains the essence of his charismatic presence and exudes some of it confidently as Owen. As for Howard, she dispels the typical damsel in distress stereotype and is her own heroine when Claire pairs up with Owen to stop the hybrid from its rampage. Last but not least, Zach and Gray are the convincing siblings who look out for each other, though their characterisations need minimal elaboration. While Jurassic World may not be able to retain the originality of its classic predecessor, it readily wows in other aspects such as visual quality. The use of 3D does make certain aspects stand out, like dinosaur claws as it pierces glass barriers and the teeth of another as it catches prey. As a science fiction movie, it sticks close to its genre definition and eschews scientific accuracy and dinosaur logic. Nonetheless, it definitely provides entertainment, both for returning fans of the Spielberg classic as well as a new generation of kids. Jurassic World opens in theatres today.